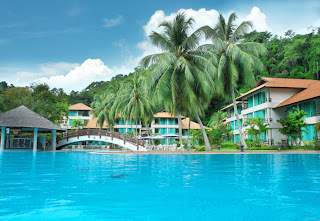 Pangkor Island Beach Resort located on an unspoilt tropical island of Pangkor , on the west of Peninsular Malaysia, is surrounded by 73 acres of lush tropical Jungle, exotic land and marine life. On this private enclave, it offers 1.2 kilometres of white sandy beach with inviting emerald green sea. In attractive low rise Malay-style architecture, this recently refurbished 258 rooms resort inclusive of suites spans across a cluster of private villas, the premier Ocean Wing, Pacific Wing and Garden Wing The newly renovated villas is an epitome of a traditional Malay village, sited on one end of the bay along the undulating slope covered with tropical jungle, with the sea front right on its doorstep. Each of the villas offer commanding vista of the sea and is luxuriously furnished with a large day bed fringing the bay windows, deep sunken bath and an oversized outdoor shower, surrounded by tropical jungle.